(AITMIR) Faculty of Applied IT, Machine Intelligence and Robotics - University of Information Science & Technology "St. Paul the Aposle"
The presence of microchips or integrated circuits in nearly every kind of modern machine allows for some degree of intelligence in most mechanical and electronic devices. Automated processes, “expert” systems; tasks involving sorting, routing, reminding, adjusting and even repairing, all may involve some level of programming that has been designed, developed and tested by a person or team that understands applied informational technologies, machine intelligence and/or robotics. Students in this faculty are often fascinated by the philosophical, as well as the technical aspect of artificial intelligence, although the curriculum is primarily focused on applications. Topics within this field include automatic reasoning, logical reasoning, and automatic deduction. Applications include formal quality checking of software and hardware, planning, computer-aided decision making, automation, monitoring processes, stimulus recognition technology and algorithms and robot dynamics. 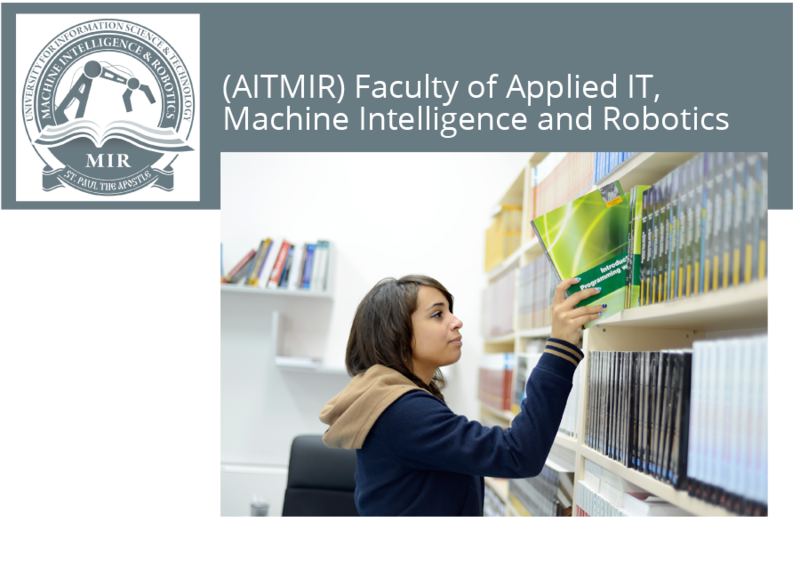 Courses in this degree program focus on artificial intelligence and the practical aspects of making intelligent machines work, with a special focus on the theoretical and mathematical foundations that make automatic reasoning possible. The field of Applied IT, Machine Intelligence and Robotics can be seen from at least three different, but closely interconnected points of view. From a technological point of view students receive basic and advanced training in the nature of robotic components (some background in physics is helpful). From a purely mathematical standpoint, you will study aspects of probability, linear systems, and stochastic processes, used in many automatic reasoning and planning problems. From a logical and symbolic viewpoint the course work covers basic principles of cognition, automatic reasoning and search, and decision theory. Upon graduation from this program, you get a degree in the field of Applied IT, Machine Intelligence and Robotics according to your chosen length of studies. Robotics and artificial intelligence are among the most attractive fields in computer science, and the demand for MIR professionals is expected to continue in the future. Students are expected to gain practical experience in research projects involving, for examples: robot emotions, behavior, motion, vision and recognition. Current industries and high technology companies use automatic or semi-automatic planning, decision making, quality and safety checking, in their industrial processes; therefore, graduated students from this faculty will have the opportunity to offer a unique specialized profile for a wide range of potential employers. The study program E-Government, E-Business, E-Culture is a broad technical field in computer sciences that includes subjects such as E-democracy, E-management, E-ethics, E-media, E-diplomacy, E-banking, E-marketing, E-journalism, social networks, etc. The purpose of the “3E” study program is to educate specialists in these areas that could meet the different needs of social segments. The “3E” program is a new and creative approach to the formal educational system attempting to provide a positive change through the use of the information and communication technologies aiming at the creation of a so-called “E-society”. Students will learn about the concepts, techniques and methods that connect the information systems and social processes, as well as their strategic importance; they will also gain practical experience in designing platforms and information systems, develop an ability for critical thinking regarding their implication in modern social processes; they will be trained to apply the electronic devices, technologies and tools for developing the different areas foreseen in the program such as: E-democracy, E-management, E-ethics, E-media, E-diplomacy, E-banking, E-marketing, E-journalism, social networks, thus creating the basis for global positive change. During the studies, the student will acquire knowledge of broader educational area related to the application of information science and technology in the field of public administration, economy, and culture in all segments of modern society “E-society”, thus becoming able to apply these concepts to real-situation modeling. E-Government, E-Business, E-Culture is a study program implemented for a period of three years i.e. six semesters, according to 3 +2 model for undergraduate studies and after graduation the student obtains a university degree in Information Science and Technology in the field of E-Government, E-Business, E-Culture and is conferred a title of Bachelor in Information Science and Technology in the field of E-Government, E-Business, E-Culture and obtains 180 ECTS.